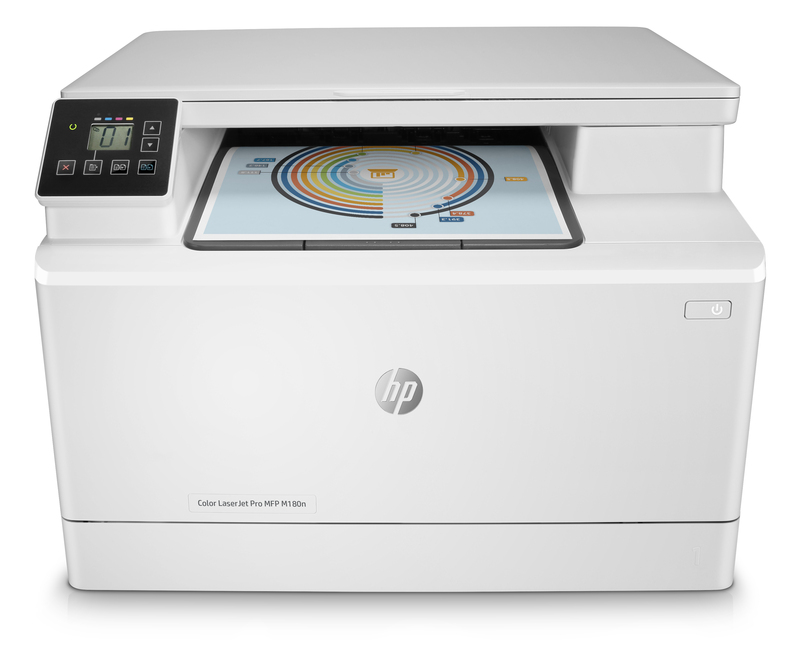 The HP Colour Laserjet MFP M180 is a workhorse multi-function printer designed for use in smaller or mid-sized offices. With mobile and Ethernet connectivity, as well as a USB port designed for printer-to-computer direct printing, this multi-function printer can keep up with the demands and rigours of any modern workplace. Printing, copying and scanning capabilities come as standard with this machine, while fax capability is an optional extra. In terms of speeds, the HP Colour Laserjet MFP M180 has a print and copy speed of 16ppm. This hard-working, highly productive and versatile MFP is a great choice for smaller offices or mid-sized workspaces. The HP M180 weighs roughly 15.7kg. Featuring a simple, box-like design and matte off-white finish, this is an unobtrusive multifunction printer that would fit in with almost any office décor. There is an LCD display screen with an adjacent easy-to-use, six-pushbutton control panel, which helps make the printer very easy to navigate. The HP Colour Laserjet MFP M180 has a 150-sheet input tray and 100-sheet output bin. The main advantage of this multifunction printer is its versatility and high productivity levels combined with a relatively low price point and size. This is the ideal machine for offices or workspaces of five or fewer users where not only productivity and workflow are prioritised but so too are results. The print resolution is 600x600dpi in both black and white as well as colour, while the scanner offers an optical screen resolution of up to 1,200dpi. Other advantages include Ethernet and USB connectivity, as well as mobile printing capabilities with supported devices and apps, such as Apple AirPrint, Mopria and HP ePrint. It’s a shame the HP Colour Laserjet MFP M180 multifunction printer doesn’t offer built-in wireless connectivity.